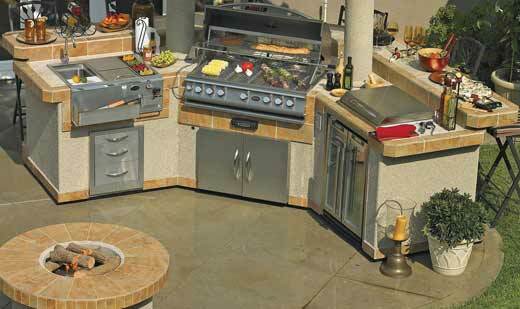 Quality standards are at the core of every Cal Flame Outdoor Kitchen. From the inside out, the quality construction is undeniable. 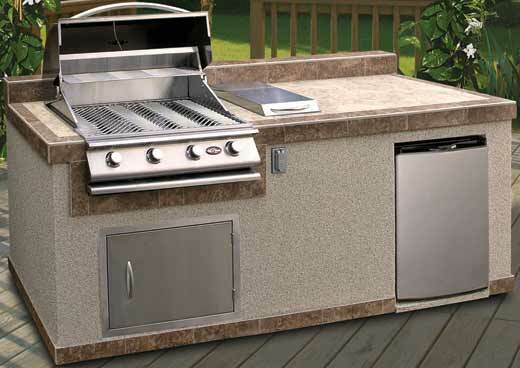 Each BBQ Island begins with a sturdy metal frame constructed from commercial-grade 16-Gauge Galvanized Steel. The island is then dressed in Hardibacker ceramic tile backer board for added durability and moisture resistance. Additionally, your outdoor kitchen is finished in the material of your choice and fitted with the cooking equipment you selected. Best of all, with premium electronic options to choose from, you can build a complete entertainment center outdoors! PV6004 6' Outdoor Kitchen Island is a stylish state-of-the-art outdoor kitchen island that provides the prefect space for cooking wonderful meals and entertaining family and friends. The beautifully equipped island can be customized with a variety of unique features including 4 or 5 burner grills, side burners, LED lighting, under counter lights, iPod Station w/ speakers, Beer Tap Refrigerator, Ice Maker, propane tank Drawer, and many other exciting features to choose from. Cal Flame makes it easy to create the Ultimate Chef's Paradise. Dimensions - 73.5" x 45" x 33.75"
Porcelain Tile - Porcelain Tile 12" x 12"
PV6016 Outdoor Kitchen Island offers a spacious cooking space and elevated bar with seating for four (4). The state-of-the-art outdoor kitchen island can be customized to include a 4 or 5 burner grill, side burners, LED lighting, under counter lights, iPod Station w/ speakers, bottle opener and catcher, vertical or horizontal access doors, Beer Tap Refrigerator, ice maker, Propane Tank Drawer, and many other exciting features to choose from. 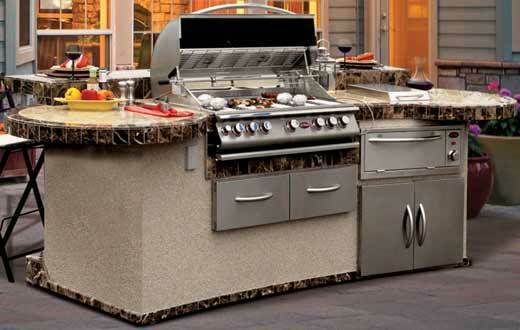 Entertaining and grilling delicious meals are simple and fun with the PV6016 Outdoor Kitchen Island. 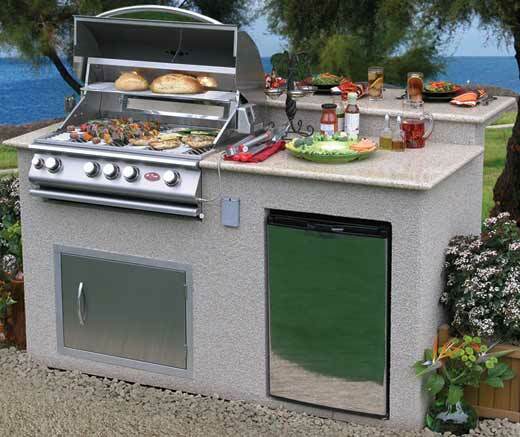 Dimensions - 73.5" x 45" x 46"
Building the ultimate outdoor kitchen is simple and fun with the new Cal Flame PV7000. It is an elegantly designed state of the art Outdoor Kitchen Island that provides the prefect space for cooking wonderful meals and entertaining family and friends. The beautifully equipped U Shaped Island seats 8 – 10 people comfortably, and can be customized with a variety of unique features including 4 or 5 Burner Grills, Deluxe Double Side by Side Burners, LED Lighting, Under Counter Lights, iPod Station w/ Speakers, Beer Tap Refrigerator, Ice Maker, Hibachi Drop in Gill, Stainless Steel Sink with Faucet, Propane Tank Drawer, and many other exciting features to choose from. Dimensions - 126" x 44" x 51.75"
The GPV3032 Grand Pavilion Outdoor Kitchen Island is the perfect blend of elegance, style and functionality. It offers a spacious cooking space and elevated bar with seating for 6 (six). The state-of-the-art outdoor kitchen island can be customized to include a 4 or 5 burner grill, hibachi grill, deep fryer, side burners, LED lighting, under counter lights, iPod Station w/ speakers, storage drawers, stainless steel sink, bottle opener and catcher, vertical or horizontal access doors, ice maker, propane tank drawer, and many other exciting features to choose from. Hosting small gatherings or grand functions will be exciting and fun with the GPV 3032 Grand Pavilion Outdoor Kitchen Island. Dimensions - 134.5" x 45" x 52"
Dimensions - 190" x 45" x 46.25"